These are the books that are in my collection. If you see one that you like, you can click on the title of the book and you will be taken to Amazon.com where you can purchase your own copy. 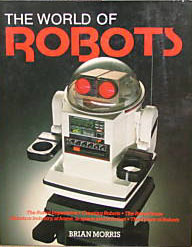 While the "brains" for the robot outlined in this book may be somewhat dated, the basic principles and techniques are just as relevant today as they were then. From the physical construction to the basic electronics, you are sure to learn something. Not to mention the material presented on Artificial Intelligence and methods for implementing it for a totally unique creation. Many of the specifications for the the robots on this site came straight from these pages. 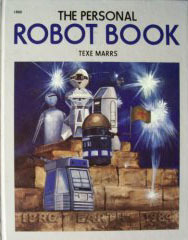 A virtual robot encyclopedia, there are entries on Heathkit's Hero, Tomy's Heroid, Hubotic's Hubot and many others - this book is a must have for any robot collector's bookshelf. This book could well be an amateur robot-builder's first reference guide. Containing complete plans for 11 robots as well as information on Robotix, Lego Technic and Mindstorms, you'll be busy for quite a while. 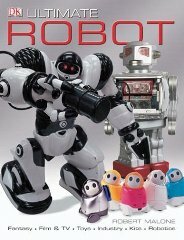 Another robot encyclopedia - this time geared more towards children, although adults will enjoy reading it just as much as their kids do. 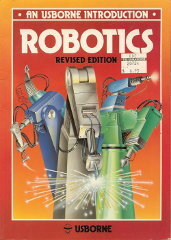 Includes write-ups on ancient "androides," industrial robots, AI computers and of course the obligatory movie robots. "Whether you're a robot geek or robot guru, this is the guide for you!" 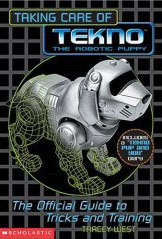 If you happen to be one of the millions of owners of a Tekno Puppy (or really any Tekno Pet), you will want to keep a copy of this book on your shelf, if only to say that you have it. Not a whole lot on unique information here that you don't already get from the instructions that come with the pet, but hey... You can always use another robot book in your collection. Am I right or am I right? Again, the information presented is slightly dated (1978 to be exact), but still well worth the read. The mechanics of robot-building really doesn't change that much over time, and the basics of electronics are still the same as they were 20 years ago. Whether you are looking to build a truly retro-bot or just brush up on "ancient" technology (back when robotics was art), you will love this book. If you are lucky enough to own a Roomba, or are just thinking about it, I highly recommend you get your hands on this book! 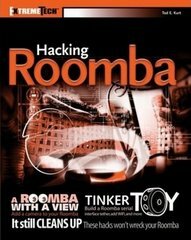 The author starts by showing you how to connect your Roomba to a computer through a serial tether to issue commands directly. Then, once you have that down, you will learn how to connect wirelessly through bluetooth and then through 802.11 Wi-Fi. The best trick in this author's bag is installing Linux on the Roomba (through a router) making it a fantastic mobile base for just about any robotic project! 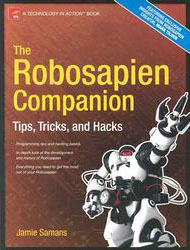 If you own a Robosapien, you are going to need this book. It starts out with a little bit about Robosapien's creator - Mark Tilden. Then it goes on to detail the inner working of your robot, giving info on repair and hacking. You will also learn, in-depth, the 67 functions that control Robo and how to get the most from them. 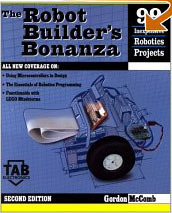 If you are into building your own robotic creations, you might want to give this book a read. Everything from circuit design to advanced software programming is covered. Even if you're already experienced in PIC microcontroller circuitry, you will probably still want to have a copy of this book on your shelf. After you have read it once, you will use it over and over again as a quick reference throughout all of your PIC-based designs. Cheaper than a Basic Stamp - this is my microcontroller of choice. This children's pop-up book appears to revolve around a little robot who has gone off to space camp or something. It has him writing home and asking about his family. There's something to do on every page and the pop-ups are really good. 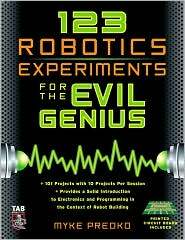 What would a list of project books be without at least one from the Evil Genius series? This book, like the others in the same series, start out teaching basic theory, building on that and expanding to bigger and better projects as the book progresses. Most of the projects can be built with simple, everyday items found around the home. The only exception being the electronics components - and even those are likely to be in your junk box. You do have a junk box, right? 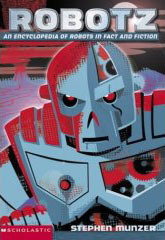 Not only does this book address one of my favorite subjects - robots - it's printed in the motherland - Italy! 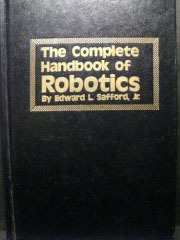 This large format book has lots of information that anyone interested in robots will want to read over and over again. From the history of robotics to movie robots to robots of the future - it's all there. 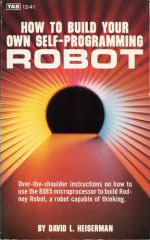 Although this book, a collection of articles previously published in Omni magazine, deals mostly with computers, I include it here for the single chapter that it dedicates to the mechanical aspect of the subject - the robot itself. 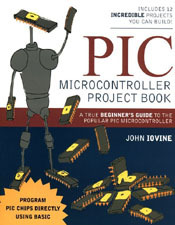 If you are thinking about building a robot, or even modifying an existing robot, and you want to use your handheld PDA to control it then you'll want to check this book out. Here you will find everything you need from design ideas to a specific project example complete with schematics, PCB artwork, software listings and mechanical dimensions and assembly instructions. Then you are introduced to more advance topics, such as RF wireless communications, GPS positioning and even using a barcode scanner - not quite sure about that one! Software is compatible with both the Palm Pilot and the Pocket PC. This book is written in two parts: "An Introduction to Personal Robots" and "Brand-Name Buyer's Guide". The first section gives, as many other books here do, a brief history of robots, from their very earliest beginnings to modern day (for the book, anyway) marvels. Whereas most of the other books deal in generalities, this one uses specific models as examples. If only for the information given on these select robots, this would be a good resource. But Part Two is where this book really shines. It showcases, in great detail, ten particular robots. The bots chosen for this honor are Topo, Hero 1, RB5X, Hubot, Hero Jr, Turtle Tot, FRED, and, sharing a chapter - Dingbot, Verbot and Omnibot. Even if you are only interested in one of these fine machines, this book is well worth owning for the goldmine of information that is available on each bot. A pretty good 'Introduction' to robots in everyday life, from industrial robots to the (at the time of the printing) modern toys. This book has seen some living from the looks of it. 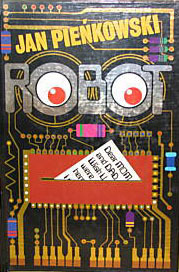 If you are into the history of Robotics, then this book is definitely for you. With 160 pages of classic black and white photos (with the exception of 13 color images) from the earliest Egyptian depictions of automatons to the more 'modern' robots beginning to invade 1978, you are sure to be entertained for hours on end. 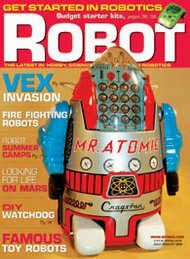 Now published bi-monthly, Robot is packed full of articles on robots both old and new. New robots are reviewed and old robots are remembered. Plus information and projects for building your own robots. I was very excited when my first issue came! 300 Baud was an idea that was ahead (or is that behind) it's time. This was a small magazine publication that, unfortunately, only saw three issues before ceasing publication in 2010. 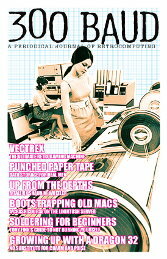 Dedicated to vintage computers and programming, each issue was packed with articles on the hardware and software that helped to bring about the future as we now know it. I am proud to have been a subscriber for their full run. 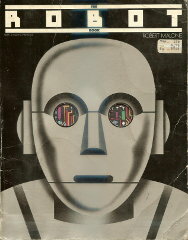 After the magazine was discontinued, their website was active for about a year offering, for free, PDF copies of the three original print issues. The website is now no longer in operation. I have, therefore, decided to offer the three issues here, in their original PDF format in the interest of keeping this fantastic project from fading into history. If you are the owner of this work and there is any problem with my doing so, please email me and I will promptly remove the links from my pages. 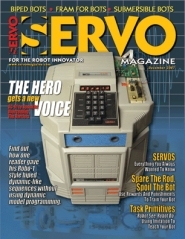 Servo is a robotics magazine brought to you by the same folks publishing the only electronic hobbyist magazine left in America - Nuts and Volts. Each month they take a look at what's new in the robotics field, in both commercial as well as industrial applications. They also have projects that you can build ranging from simple one-nighters to complex multi-parters. And of course the pioneers are honored. 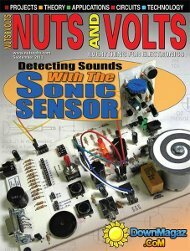 The only surviving electronic hobbyist magazine in the United States, Nuts and Volts has been in circulation since 1980. Carrying on where Popular Electronics, Radio-Electronics and the others left off, Nuts and Volts is still an excellent source of information related to all things electronics. Whether you are a beginner or an electronic engineer, there is still plenty to hold your interest, from the basics of electronic theory to the latest microprocessors. Written for and by the maker community, Make: magazine is both an old-school paper magazine printed bi-monthly as well as an online	blog updated daily. 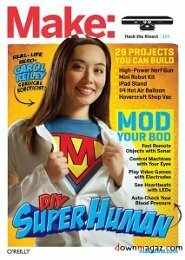 Here you will find articles on all different sorts of topics, from robotics to crafts to woodworking to electronics to survival. If you can't find something here that grabs you, you just are trying hard enough! I do wish that the print magazine offered more detailed articles without giving you just a tease and then pointing to the online articles for the complete write-up, but... it's still a great magazine for those of us in the maker movement!